A new reservoir is filling in central China. The Three Gorges Dam on the Yangtze River—the world’s largest dam—was completed in 2006, and the river is filling up its valley behind the dam to form a narrow reservoir extending more than 600 kilometers. 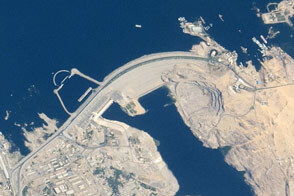 This image from April 15, 2009, is one of the first images that astronauts on the International Space Station have been able to capture of the flooding behind the dam. The main objective for the dam is to supply water for the largest hydroelectric plant in the world and to help control the devastating floods that plague the lowlands downstream from the dam. The epic scale of the dam project is matched by the level of controversy it continues to generate. Concerns about major environmental impacts, the relocation of 1.2 million people, and the flooding of 13 cities, more than 1300 villages, archeological locations, and hazardous waste dumps were raised throughout the planning and implementation. Environmental concerns include increased seismicity from the loading of the water, landslides, changed ecosystems, accumulated pollution, increased chances for waterborne diseases, and salinity changes in the Yangtze estuary. Astronaut photograph ISS019-E-7720 was acquired on April 15, 2009, with a Nikon 2DXs digital camera fitted with a 180 mm lens, and is provided by the ISS Crew Earth Observations experiment and Image Science & Analysis Laboratory, Johnson Space Center. 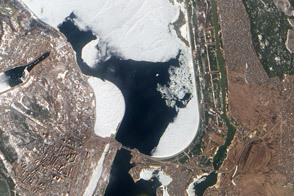 The image was taken by the Expedition 19 crew. The image in this article has been cropped and enhanced to improve contrast. Lens artifacts have been removed. The International Space Station Program supports the laboratory to help astronauts take pictures of Earth that will be of the greatest value to scientists and the public, and to make those images freely available on the Internet. Additional images taken by astronauts and cosmonauts can be viewed at the NASA/JSC Gateway to Astronaut Photography of Earth. Caption by Cynthia Evans, NASA-JSC. 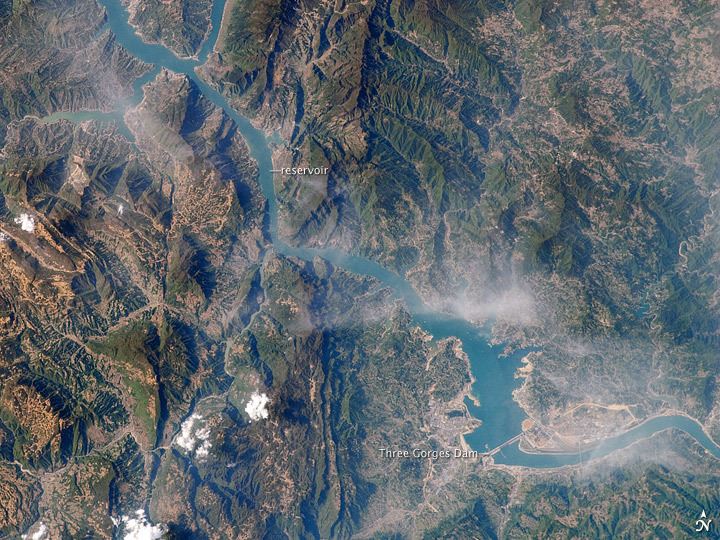 This image from April 15, 2009, is one of the first images that astronauts on the International Space Station have been able to capture of the flooding behind the Three Gorges Dam in China.